Hello! My name is Anita, and yes I am a little late to the party due to some technological issues. However, what I lack in technological savvy I make up for in curiosity, primarily in the past! For the first three years of my undergrad I majored in Law, however while accidentally taking a history coarse in the winter semester of 2017, I discovered that history was one of my passions (once again, better late than never). I am currently double majoring in Law and History with a minor in Sexuality Studies. After my undergrad I plan on attending Law School. I have always been intrigued by the idea of fascism. It may have started from reading books like George Orwell’s Nineteen Eighty-Four, or my grandpa’s war stories about Nazi Germany. Either way, I am extremely excited to learn more about fascism, and populism which I am not as familiar with. I believe we are living in an extremely interesting time politically, but can’t wait to see what the past can teach us! Hey everyone, my name is Antoine Beauchamp, and I am a third-year undergrad student with a major in political science and a minor in math. I know it is an odd combination but before I was at Carleton, I studied applied sciences at Cegep (in Quebec) so I continued along with it in University. My focus at Carleton has been more on policy but I picked this course because of the increasing talk of fascism in the world. I believe that further understanding of such terms and concepts could help me both as a world citizen and a university student. Therefore, while I will most likely switch back into a natural science stream after I graduate, I am excited to learn about fascism and the other concepts we will discuss in this class. I hope we will have a great semester discussing and learning together. My name is Meghan and I am a third year student double-majoring in Journalism and History. My particular interests in history are religious history, women in the monarchy in early Tudor England, and really, really old history. That being said, I have studied everything from the history of animals to classics. After my undergrad I plan to pursue my masters, hopefully in Ancient Religions. Populism has never been my area of study before, however I feel that an understanding of the concept and a knowledge of authoritarian governments and how they rise and function is a valuable tool for any historian. I’m Oonagh and am currently in my third year. My majors are History and Greek & Roman Studies, and I am also minoring in Archaeology. I am particularly interested modern war history and believed this class would shed light on the socio-political climate in both Germany and Italy during the Second World War. I am also very excited to learn about the remaining topics in the course, as they are all quite new to me! My name is Ali, I’m a second year political science student with a minor in history here at Carleton. I decided to add a history minor to my political science degree not only because of a personal passion for history, but also because it is clear to me that in order to develop a complete understanding of how a society currently functions it is necessary to have a solid understanding of the history of that society. Keeping that in mind it was difficult for me to resist registering for a course on the history of populism. 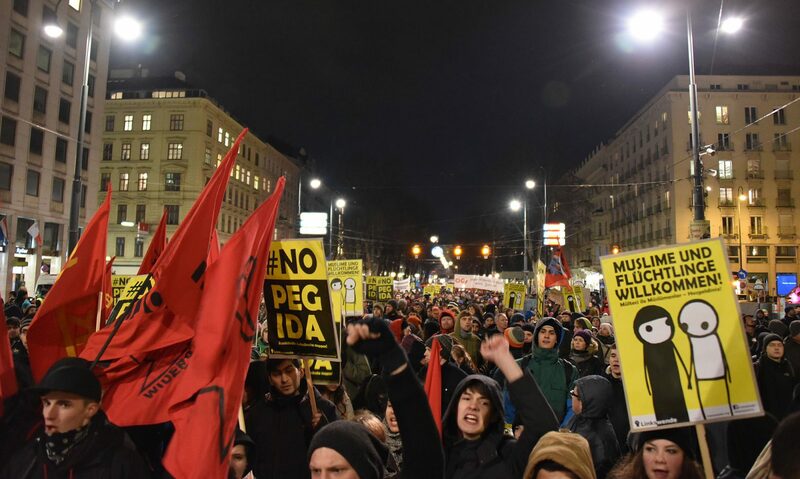 The push towards increasing austerity coupled with the historic rise in economic inequality has brought both right and left wing populist movements to the forefront of political discourse in both North America and Europe. With events such as Brexit and the election of Donald Trump few would disagree that populism has become a major force in the modern political landscape. In my increasingly rare free time I like to rock climb (despite not being very good at it), read, listen to music, and consume copious amounts of coffee. I have never blogged before taking this class so I am looking forward to figuring that out as well as exploring the fascinating history of populism with all of you this semester. I’m Reid and am currently in the final semester of my undergrad. My major is Political Science with a concentration in IR and a minor in History. When I saw the title and description for this class, I registered immediately. The role of populism, and specifically far-right movements in recent history and today, are certainly subjects that deserve a focused analysis, and I’m excited to unpack this issue. Exploring such a fascinating and often dark feature of human politics and history should be very intriguing. About me, I’m originally from Calgary! I enjoy skiing, golfing and trap shooting for sports. I’m also a huge fan of music and go to shows/concerts regularly as well as collect vinyl (my collection is about 400-ish). Travel is another hobby, so far I’ve been to Europe, Africa and a fair bit of North America. Currently planning a few months in Central Europe this summer. I’m Kathleen, I’m in 3rd year at Carleton and am a Political Science major and also a History and German minor. Politics interacting with history seems to be a big theme in both History and Political since courses and I like to keep that connection in mind when choosing my courses. Large events in history are often linked to political events and in the present we can often see events occur that are similar to these in the past. This is one of the main reasons why a class in populism is not only relevant to the world but also to what I like to study in mixing history and politics together. With all this said it might seem a bit odd that I am actually aspiring to go to law school and not pursue a career in political science, my goal is to be an international lawyer which I haven’t found to be overly connected to the subject so far. However, for my undergraduate, I really wanted to study something relevant and interesting as this subject turned out to be. My site can be found at https://thentonowph.wordpress.com/ it is entitled to reflect the point of interest I have mentioned in History meeting Political Science in current times. Blogging is not really something that I have done before so I am looking forward to the new experience of actually publishing my opinions in a public place. In Patrick Geary’s Myth of Nations, he argues that the ideas European nations and ethnicities are created by the study of the language spoken in a specific geographic area by a group of people or tribe. I do not agree with the premise of the book because the language and culture are predominantly imposed by a conquering force. These conquering people/tribes over many years incorporated and assimilated the more numerous peasant class into the stronger and more dominant culture. A few examples cultures taking over are Merovingians, the Spanish conquest of South America, and the Turkish conquest of Hellenic Anatolia. However, this is not always the case. Various communities have stayed relatively homogenous in their customs, traditions, and languages. The best example of this is the European Jews. For most of their history in Europe, Jews maintained a unique cultural, religious, linguistic, and ethnic identity inside of the more extensive European culture. I do think that as Patrick Geary states religion plays a huge role in the division of people groups. This idea of beliefs dividing populations can be seen in the article written by Amy Kaufman. Amy Kaufman mentions in her article how the Ku Klux Klan used views born in the middle ages to further a political and racial agenda. They used ideas of the crusades, defending a princess’s virtue, and taking oaths to protect their mostly protestant values. I think her correlation is very weak. She does not take into consideration that the KKK was not only a white supremacist cult but also a very openly anti-Catholic organization. All the knightly orders of the middle ages were Catholic. They were a sort of warrior monk of the time. I also find the fact she is citing the Southern Poverty Law Center (SPLC) only weakens her points. The SPLC has become very discredited in recent times. Using its position to brand “hate groups” to those it disagrees politically rather than on an objective basis. Hello! My name is Morrigan, and I am a fourth year student who is majoring in English and doing a minor in History. As someone who is in the last semester of their undergrad, I thought it would be useful to take classes, like this one, that help me to better understand the current state of the world and how we got to where we are today. My interest in history and literature stemmed from my love of reading, which is something I plan on doing a lot more of once I am finished school and have more free time. Some of my favourite books include Charlotte Brontë’s Jane Eyre, Jane Austen’s novels, and of course the Harry Potter series. I also enjoy historical fiction and fantasy, which could explain my interest in real history. My academic interests generally lie in the ‘long’ 19th century (approximately the time from the French Revolution to WWI) – many of my favourite books are from this period. However, I enjoy all types of history and literature. I like the way that literature and history allow us to understand other perspectives, and for me, especially the experiences of women in history. I find it important to understand precedents in order to understand why we are where we are now. I am in the last few classes of my degree, therefore, it seemed like an optimal time to take some classes that both are electives, and develop a personal curiosity. I have been working in social work and social services for the last ten years, and currently have a management position managing several staffing teams in an emergency shelter. Working within addiction, mental health, various forms of abuse, and other destructive behaviors people routinely engage in, has definitely influenced my world view, and view on human nature in general. My academic background is psychology and its biological underpinnings, however, I like to think I am a diligent student of history and geography. It may be mundane to some, but I see history as a long, unbroken, historical narrative based on human action followed by social or systemic reaction. I am currently engaged to a truly wonderful woman. I enjoy archery, shooting, being in the woods, Jeeps, and I am an avid collector of antiques. I took this class because it spoke to the political, and legal conflict I see in the media every day, and to be honest, I do not fully understand. The nations that constitute the post-war order are portrayed to be under attack both externally, and internally. In the western media populist leaders seem to advocate not trusting judiciary, the press, other branches of government, and calling for the jailing of political dissent. All this is predicated on the premise that migration, legal liberalism, constitutional and human rights, are synonymous with terrorism (or crime), wasteful bureaucracy, and human rights no longer needed. I am looking forward to learning more about this phenomena, as well as the many points of view this class will bring forth. I feel this plurality will add depth and understanding to the complex historical, legal, and political issues we will be discussing, because the truth always resists simplicity.